Choosing the perfect ceremony reading can be difficult, but we’ve put together some suggestions that will help your wedding stand out from the crowd. While not required, a special reading can be a great addition to your wedding ceremony, helping to add meaning, romance and even laughter. However, some readings are somewhat overused (Corinthians, we’re looking at you), and can start to lose their impact once you’ve heard them for the tenth time. What’s more, if you are planning your ceremony at a non-religious location, such as our wedding venue in Essex, you may wish to have a non-religious ceremony. Choosing the right reading can seem like a bit of a minefield, but we have some suggestions for alternative and non-religious wedding readings that will help to make your ceremony meaningful and personal to you and your spouse-to-be. Getting married is a serious business, but that doesn’t mean that you can’t inject some humour into the proceedings. A funny reading can help to provide some light relief and is perfect for a fun-loving, light-hearted couple. When it comes to humorous readings, there are plenty of great options out there that are sure to get your guests smiling. With its amusing and honest take on modern relationships, ‘Yes I’ll Marry You My Dear’ by Pam Ayres has become somewhat of classic, and there are several other poems in this vein including the anonymous ‘He Never Leaves the Seat Up’. If you and partner love all things literary, why not personalise your ceremony with a passage from your favourite book, poem or play? From ‘Captain Corelli’s Mandolin’, through to Shakespeare’s sonnets, ‘The Princess Bride’ and even ‘Winnie the Pooh’, there is a plethora of beautiful and moving options to choose from. If existing literature is not hitting the spot and you’re feeling creative, why not sit down with your partner and have a go at writing your own poem or piece of prose that perfectly sums up what you mean to each other. That’s one way to guarantee that your ceremony reading will be completely unique. For couples who don’t take themselves too seriously, a quirky reading could be just the ticket. Edward Monkton’s story about two dinosaurs in love, ‘A Lovely Love Story’, has just the right balance of quirkiness, humour and emotion to get your guests both laughing and crying. ‘Oh the Places we’ll Go’ by Dr Seuss is also a great choice for those couples looking for something a little different. If you’re struggling to find a reading that really resonates, why not take some musical inspiration and use the lyrics of a song that has some special meaning to you and your partner? This can be especially useful if you’re finding it difficult to choose between two songs for your first dance. There are loads of beautiful love songs out there and the one you choose will depend on your personalities, relationship and, of course, musical taste, but a few ideas to get you started include ‘God Only Knows’ by the Beach Boys, ‘In Your Light’ by Jon Allen, and ‘I Like’ by the Divine Comedy (which also ticks the humorous / quirky box). Whatever reading you choose, be sure to run it past your officiant first, whether you’re having a religious or civil ceremony. 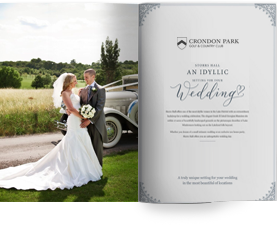 Choosing a reading, while difficult, can make all the difference to your wedding ceremony. We hope we’ve helped inspire you to find the perfect reading that truly reflects your feelings for each other and will make your ceremony both unique and memorable.